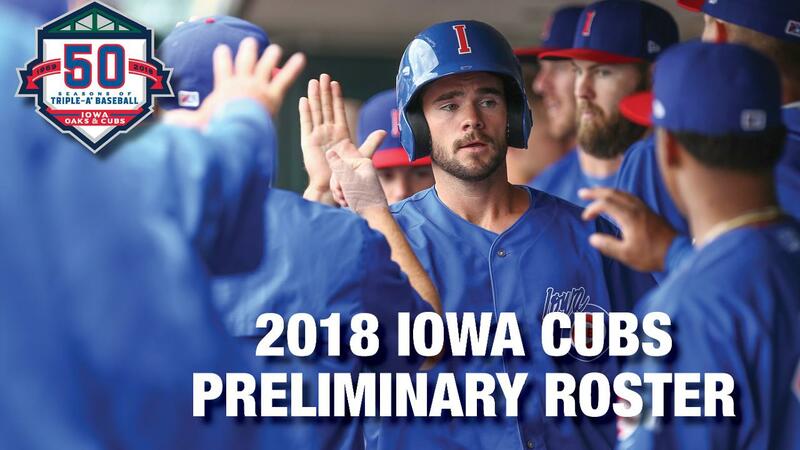 DES MOINES - The Chicago Cubs today announced the Iowa Cubs preliminary roster for the 2018 season. The roster features 16 players with major league service time and 15 players who have past suited up for Iowa. Among returners are fan-favorite C Taylor Davis and Cubs top prospects RHP Dillon Maples (15), INF David Bote (12), OF Mark Zagunis (20), RHP Alec Mills (28) and RHP Jen-Ho Tseng (9). Position players Jacob Hannemann, Bijan Rademacher, Mike Freeman, Chesny Young, Stephen Bruno and Ali Solis also return to Des Moines, as do pitchers Justin Hancock, Rob Zastryzny and Brad Markey. The Cubs second-round pick in 2012, RHP Duane Underwood Jr., will make his Triple-A debut with Iowa, after spending last season with Double-A Tennessee. Underwood checks in at No. 19 on Baseball America's list of Cubs top prospects. Also making their Triple-A debuts are RHP Craig Brooks and LHP Randy Rosario. Brooks was selected by the Cubs in the seventh round in 2015, while Rosario was picked up off waivers this offseason from Minnesota. Pitchers Alberto Baldonado, Anthony Bass, Luke Farrell, Michael Roth and Shae Simmons make their introductions into the Cubs system. All but Baldonado have MLB experience. Baldonado, a 6-4 lefty, signed a minor league contract with the Cubs after spending his career prior in the Mets organization. RHP Bass split his time between Triple-A Round Rock and Texas in 2017. He has appeared in 131 major league games across five seasons with Texas, Houston and San Diego. RHP Farrell was a waiver claim from the Reds. The son of former Red Sox manager, John Farrell, spent time in the Royals, Dodgers and Reds systems last year, making his major league debut for Kansas City in July. The Cubs mark Roth's fourth organization through his last four seasons and his fifth over his eight-year professional career. The 28-year-old lefty first debuted for the Angels in 2013 and last logged big league time in 2016. Righty Simmons signed a split contract with the Cubs in February, after spending 2017 with Seattle and the five seasons prior in the Braves organization. Infielder Ryan Court and first baseman Efren Navarro are also slated for their Iowa debuts. Court, an Illinois native, grew up a Cubs fan and joins the organization after spending 2017 with Triple-A Pawtucket (Red Sox). Navarro is an MiLB Gold Glover, entering his 12th professional season. The 31-year-old spent nine years of his career in the Angels organization. He holds several career offensive and defensive records for the Triple-A Salt Lake Bees. Navarro split his 2017 between Detroit and Triple-A Toledo. Chris Gimenez is the veteran of the team, entering his 15th professional season. The catcher signed a minor league contract with the Cubs after spending 2017 in Minnesota. Gimenez has appeared in the majors in each of the last nine seasons. Outfielder Wynton Bernard rounds out the I-Cubs roster. The 27-year-old was drafted by the Padres in 2012. He spent his 2017 campaign with Triple-A Sacramento. Iowa opens the season at Principal Park on Thursday, April 5 with a 3:08 p.m. first pitch against the Oklahoma City Dodgers. The first 1,500 fans in attendance will receive an Iowa Cubs magnet schedule. For more information or tickets, visit www.iowacubs.com.